Roads should be variable speed, not only 50kph. I think every roads are should held by public service(as a player). When city is grown, roads should not been change to city road. example: two different city roads in simple sample. Less different for speed, but looking is large difference. May be, only my case. No, a city road is the kind of road that is used to access city buildings and which for that reason has a capped speed limit. There is no reason to have a specific type of road for city growth. The reduced speed limit is the only game play reason that city roads exist. The thing most people seem to agree about is that it is unfortunate that buildings will turn any road into a city road (essentially in order to have its driveway there), because this makes it impossible to have a major road through a town or city without making a three tile wide path through it and (ab)using various objects on the two outer tiles to protect the road in the middle tile. If the town only is ten tiles wide, that is a lot to tear down. At the same time, it is natural for towns to grow out along regular roads entering it, and downgrading the speed limit as it does so. I believe it has been an agreement that what is needed is simply some method of having ways that vehicles can drive on, but which cities do not use for spawning buildings and which therefore do not get a reduced speed limit. Cities should perhaps also not be able to connect its city roads to that road at a whim either. I agree with Ters in what it's normal for cities to have city roads (not only for the speed limit, for the nice pavement too ) and to downgrade roads they grow along. As he said, the way of having high speed roads in a city is protecting it with fences (only available as addons in pak128). If you draw such a highroad in rural areas, protect it near the cities and everything will be okay. If you want to draw such a road in an already existing city, you had better use elevated roads. However, drawing efficient networks through developed cities always require heavy transformations and lots of money. Hmm...sounds like some of the religious war. So, what feature should this patch implement more? Limit (or forbit) to connect cityroad to high speed road? Show no pedestrian on the highway? I don't understand what matters to you for this feature. All city buildings should require at least 1 of their 8 surrounding tiles to contain a city road type. This road type can be obsolete or from the future. Trying to violate this rule causes road construction or demolition to fail. This is to prevent people from upgrading all roads in a city to the fastest roads. Best implementation would be to use the city build rules in reverse, failing if no rule passes for the building's position. City building placement only recognizes roads that are a city road type or a road type with maximum speed equal to or slower than the current city road type. This prevents cities from expanding along high speed roads while still allowing companies to pre-place suitable roads for city expansion. All automatically built city roads belong to the public service provider player so are owned. Currently they belong to null so technically no one pays for them and this kind of defeats the purpose of the public player (inconsistent usage). All roads placed next to attractions or city builds automatically transfer ownership to the public service player, independent of maximum speed. This is to prevent players from denying other players road space in a city. All roads placed next to attractions or city buildings that have a maximum speed limit equal to or less than the current city road maximum speed limit are automatically replaced with the current city road type. This exists so that one can replace city roads as a company when it is not directly available for construction, eg for downgrading no longer used high speed roads to allow for city expansion. Roads that have a maximum speed limit higher than the current city road maximum speed limit cannot be converted to the current city road type. This is to allow high speed roads to run through a city. On map creation, you get road connections between cities that usually have a higher speed limit than city roads. I don't see a reason why those should not be replaced by the city on growth. Since it's a transportation game, roads should have priority over city buildings. So I would say it's better to allow the road, but gradually remove buildings which could not be buildt based on city rules. If all citybuildings can be chosen for updating (not sure whether that's the case), add an extra check if a building is allowed to exist in it's spot based on cityrules, and if that is not the case, demolish it. A cityrule with a chance of zero counts as legal, so you can define variations in the rules which will never be buildt, but if they come into existence by shaping roads or placing the buildings manually, they won't get destroyed. A player would be able to replace all city roads with a max speed road, but as time passes, the city will rot away. Not instantly, just building after building, giving the player time to correct his mistake. A model-railway-player, however, can turn city growth off. Since buildings would not upgrade anymore, they won't be removed either, allowing for any placement the player pleases. I agree with Leartin on those three points. DrSuperGood's fifth point is also acceptable. The other points are irrelevant for me since I play alone and don't really care about different players. Counterpoint: -freeplay exists, and yet not everyone uses it. Problem is trolls or ignorant people will purposely do this to kill cities. Plenty of ways trolls can be disruptive already. What if there were a way for the server admin (via public player) to protect or control such behavior within city limits? If that happens on single player: Jokes on you if you manage to kill a city. EDIT: Scratch that. 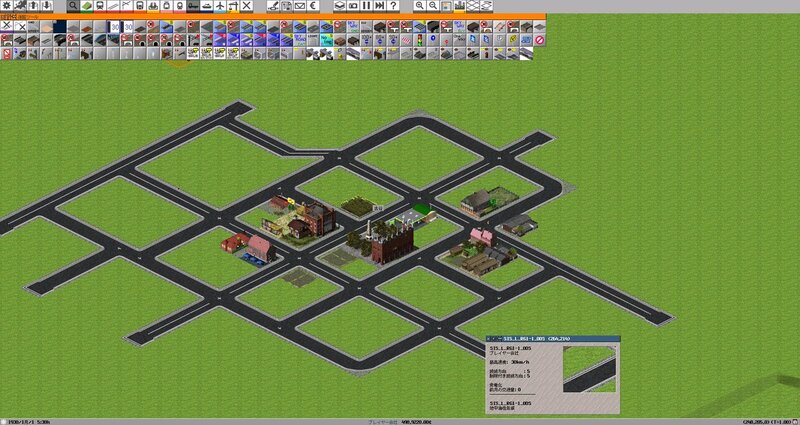 I forgot players will need to build small bits of road for loading bays and the like in cities. "Simutrans is a transportation simurator, NOT a scenery simurator." Is that right? And is that a common understanding? You mean to torture cities with a slow, painful death, giving a game master time to rescue them from the dungeons respond by kicking the player and restoring the city roads. City buildings can be removed with the removal tool by any player, there is no need to go through extra steps if you want to destroy a city. I doubt Simutrans could get an AI that's able to identify destructive behavior and correctly differentiate it from someone who tries to restructure, so in order to stop someone from tampering with cities, you'd have to forbid it completely - no more destruction of public property, neither in form of citybuildings nor by replacing public roads. As a game setting, of course, since only multiplayer really needs that. This would play nicely with your idea that only low-speed player roads would be replaced, it effectively means that any part of the city that already exists can't be changed, but you can plan ahead for any new development. Just like in reality, where nobody thought of public transportations at a time before the game timeline starts, so it's a pain to plan bus routes through medieval city cores. City building placement only recognizes roads that are a city road type, a road type with maximum speed equal to or slower than the current city road type, or a public road. This prevents cities from expanding along player-buildt high speed roads while still allowing companies to pre-place suitable roads for city expansion and growth along public connection roads existing since the start of the game. All roads placed next to attractions or city buildings that have a maximum speed limit equal to or less than the current city road maximum speed limit are automatically replaced with the current city road type. Whenever a citybuilding would upgrade, check if it's placement is legal according to cityrules, and if not, demolish it. Cityrules with chance of zero count as legal. * Due to the change that faster speed public roads can be devoured by cities to allow them to devour roads the game begun with, you cannot change ownership of fast roads, else they become cityroads in the long run. However, if anti-griefing is active, it is impossible to deny somebody else access to a city, since the generated road network always stays public. One could deny access by building a wall around the whole city or by occupying all city roads with stations, that however wouldn't be dealt with by this rule. ** From earlier posts, it's clear that's not what the majority of players wants, but it makes sense in online games with strangers. It has to work as a game that allows creativity AND as a creativity outlet. Best compared to Rollercoaster Tycoon, though a bit more on the 'game' side. I suppose it is right. But I'd like to simurate scenery too. And I also think that. I don't like that. That would severely curb a town's ability to grow, as pretty much all roads surrounding the city would be roads built by me and these roads would often have a higher speed limit than the current city road. There are also times where I have roads with a speed limit equal to or lower than city roads that I want the city to ignore, because they are behind choose signs. Having the city build extra connections to it might mean that vehicles get in without passing the choose sign, causing queues that spill out into the city streets. I therefore want to tell cities to stay away from my roads explicitly. Is there any reason why all city roads must have the same speed? Above 80km/h we have rural roads such as highways. That said, there should be 2 or 3 types of city road. The game converts the player-owned roads to the closest available city road type, instead of leveling every road down to 40 or 50 km/h with the same look. If the player doesn't like the plain, old, slow city road, he can switch to public player and override it with an alternative city road that will be left untouched by the city growth. I don't like that. That would severely curb a town's ability to grow, as pretty much all roads surrounding the city would be roads built by me and these roads would often have a higher speed limit than the current city road. There are also times where I have roads with a speed limit equal to or lower than city roads that I want the city to ignore, because they are behind choose signs. Having the city build extra connections to it might mean that vehicles get in without passing the choose sign, causing queues that spill out into the city streets. I therefore want to tell cities to stay away from my roads explicitly. Yes - any method that would make it so high-speed roads around a city will not be converted will curb that town's ability to grow. No matter how it will be implemented, you would always have to deal with that, unless cities become somehow able to reach over - but that's a seperate topic on city growth. The better question is: Should a road generally be swallowed by a city, except if a player forbids it (as with the wayobj-patch) or should a road generally not be swallowed, except if a player allows it (in this case: By having it slow enough or turning it public). On a more abstract level, on the balance between cities hindering players and players hindering cities, which should be the default, and which the explicit choice? I'd choose the later, since it seems to me that if I impede the city, it was my fault for not thinking enough about it - something that already happens with tracks anyway. If the city takes my roads, it feels like the games fault, much more frustrating. As for the other way around: To avoid a city eating your roads, use faster roads. Granted, it's a bit sloppy, but it should work well enough. I'm open for either making a road non-cityfiable using a way object (or some other flag), or by having three (or more) classes of roads. That would be at least city road, regular road (will turn into city road on demand) and highway (will not turn into city road and does not support buildings). I don't see much purpose in the finer grained subtypes of city road that IgorElizier proposes, but I'm not against it either. They should not be devouring the inter city roads as they are meant to be faster speed roads. This does not even effect expansion as nothing stops the city from making its own city roads branching from that. Games are more easy to play, and potentially more fun, when the logic remains as logical as possible. Adding or bending logic for exception cases makes the game less easy to play and potentially annoying. - if the one way patch is implemented than a motorway should be possible with a limit of 100km/h inside the city zone and the city should be able to go on the other side of it with a bridge or tunnel (like for tracks or rivers), no takeover and no connections, do not count as access for buildings. In my opinion, there is no problem if a city is surrounded by untouchable roads. They can be treated like water ways. Cities can now build bridges over rivers, so they could build bridges over motorways as well. In the game, player can modify and add definition of road like these. When over write road, choice the most nearly speed road. If road has the slowest speed, road is being as it is. Allowing cities to expand over "untouchable"/occupied tiles is perhaps a valuable discussion but should probably get its own thread. For the record, I'd like to see that. I wasn't thinking that the city was surrounded by untouchable roads like a moat, but that all roads radiating out of the city are untouchable (because it is too easy to build untouchable roads unintentionally). Maybe to such a degree that there is no space between them and other obstacles for both city roads and buildings, but the issue would mostly be that cities would not grow out along the roads leading to it because they are seen as obstacles rather than arteries. Intercity roads are meant to be faster speeds, but once they are encased by a city, they are no longer intercity - they are in the city. Those are exactly the kind of roads a city would swallow in reality when it expands, as it's usually laws that say "speed limit in cities is 50km/h" (or something similar) and any exception has extra signs. Hence if the intercity road falls into the city area, it would generally be a slow-speed city road, unless there is an exception. In Simutrans, citys spawn first, and intercity roads connect to the outskirts. There should not be a difference between a city spawning at game start and a city growing during the game, hence either the intercity roads are pushed outwards, or they start out connecting from townhall to townhall, being always present in the middle of town. I think it's very logical if the public hand does not steal from the player, but does with it's own roads as it pleases, especially if in return, the player can't mess with public property. It's also not an exception. An exception would be if intercity roads generated at the start of the game would have an invisible flag that allows them to be swallowed, which other roads buildt by the public hand would not have. Or if only the road defined as intercity road could be devoured. But in this case, it's a solid, logical rule, which is easy enough to understand and does not require an additional flag for 'roads that can't be swallowed' or 'roads that can be swallowed', since instead, the player can allow swallowing by making it public, or disallow swallowing by picking a faster road. It is what I want to say. I gave an example about highways at first because it's easier to introduce, but I think it was not good example. What I want to do with this patch the most is use multi types of road in the city. I think Manche's method is better way to achive these problem. It is good idea to solve privent unlimited access to highways. Nothing to do with the general discussion, but have you ever thought of using wayobjects placed on the cityroads to get your different graphics? Perhaps even speed limitation works (you can have a 60 km/h basic city road and your wayobjects limit to 50, 30, etc.) - if it's mostly for "model railway" reasons, that should do the trick without any need to change the program. I don't think having different cityroads leads us to a conclusion about the main problem of "city downgrading player roads". Even if they existed, I suspect no pakset would come with anything faster than 60km/h, instead there would be even slower roads to deal with. Or they only alternate graphically, which is nice, but does not require a discussion about gameplay.